Microsoft Word exists in many different versions. Sometimes you need to know what Word version you have installed. For example, you may find add-ins on this site that are relevant only for specific versions of Word. The information below will help you find out what version you have. There are only few visible differences between Word 2016 and Word 2019. Word 2019 has a new command, 3D Models, on the Insert tab. It is not found in Word 2016. 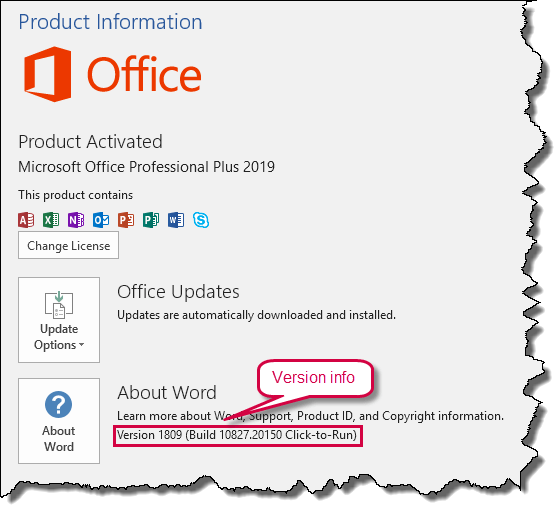 Word for Office 365 is the version you have if you have Office 365 installed. With Office 365 you will automatically have the latest Word version so you can expect Word for Office 365 to look like Word 2019. However, you may have the Office version updated with a delay depending on which Channel you are on, i.e. how often your Office 365 is updated (Monthly Channel, Semi-Annual Channel). Has ribbon with HOME, INSERT, PAGE LAYOUT, etc. Once you know which version of Word you have, you can find more details about the specific version by following the relevant information below. 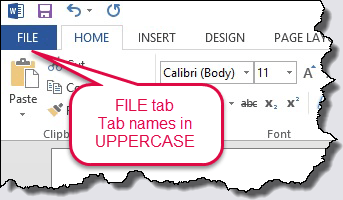 Select File > Account category (left side of dialog box). You will now see the version number in the right side of the dialog box. See the examples below. 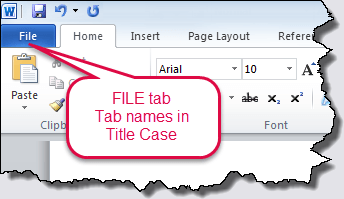 Select File tab > Help category (left side of dialog box). You will now see the version number and more information in the right side of the dialog box. 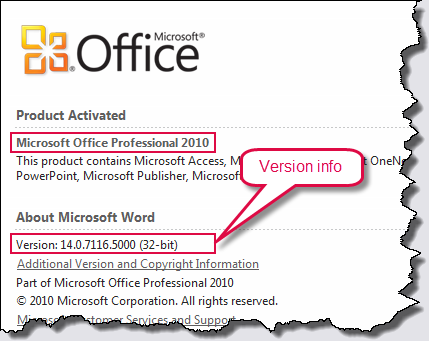 Note that Microsoft Office 2010 exists in both a 32-bit version and a 64-bit version. The illustration below is from a 32-bit version. You will see that information at the end of the version number. See more about 32-bit and 64-bit versions of Office. 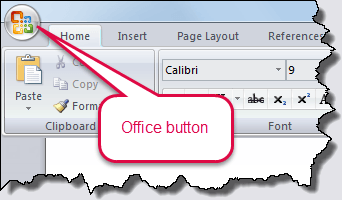 Select Office button > Word Options > Resources category (left side of dialog box). You will now see the version number in the bottom right of the dialog box. Click the About button next to the version information to open a dialog box with more details. Select Help menu > About Microsoft Office Word. You will see the version information in top of the dialog box that opens. The illustration below tells it is Word 2003. If you have e.g. Word 2002 or Word 2000, you will see that. We talk about e.g. Word 2010 or Word 2016. Each version of Word has a version number that used to be unique. However, with the launch of Office 2019 in October 2018, this is not exactly true anymore: Word 2016, Word 2019 and Word for Office 365 share the same number! In the illustrations above for Word 2010, Word 2007 and Word 2003, you see a long number, e.g. 14.0.7116.5000 for Word 2010. The leftmost part of the long number (here 14) is the version number for the Word version. In case of Word 2013, Word 2016 and Word 2019, you must select File > Account category and click the About Word button to see the corresponding number. It is shown in top of the dialog box that opens. The number must be used e.g. in macros. The last two groups of digits in the long number contains information about which updates have been installed. For Word 2003, you also see SP3 after the version number. It tells that Service Pack 3 has been installed. As explained above, Word 2016, Word 2019 and Word for Office 365 have the same number. This is not practical for developers but that is how Microsoft has implemented it. 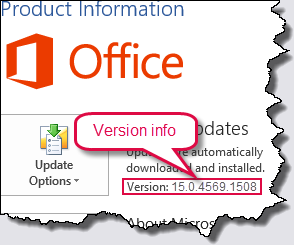 If you have Office 365 installed, you will automatically have the latest Word version. However, you may have the Office version updated with a delay depending on which Channel you are on. You will find the information via File tab > Help as illustrated in Figure 9 above. If you compare the result with the number you see in the About dialog box (see illustrations above), you will see that the last part of the build number is missing. See below for a method to find the full build number.